If skyrocketing tablet sales and cute videos of babies that confuse magazines for iPads are any indication, touchscreens are the interface of the future. But there's just one problem with that portentous prediction: If it's true, laptop buyers are stuck with one foot in the past. 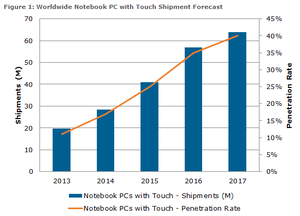 The market analysts at NPD DisplaySearch say touchscreen notebooks just ain't selling. 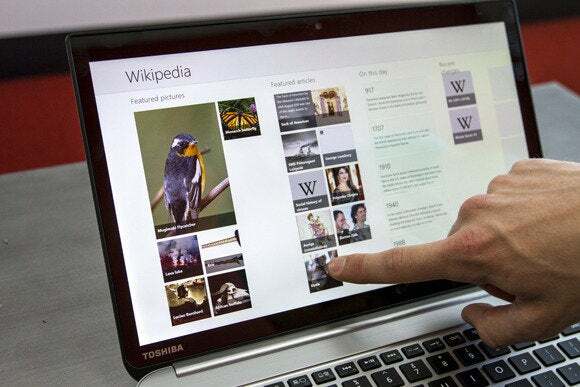 Touchscreen laptops only accounted for 7 percent of all laptop sales in the first six months of 2013, the firm claims, though that's expected to rise to 11 percent by the end of the year. The news isn't good for Microsoft, which overhauled its Windows operating system to showcase a new, finger-friendly "Modern" interface in Windows 8. Touchscreen laptops were hard to come by in 2012, and Microsoft pointed to that to at least partially explain the slowing PC sales of the last holiday season. "The level of demand I think surprised a lot of people, and frankly, the supply was too short," then-Windows co-chief Tami Reller explained at CES 2013. "I mean, there was more demand than there was supply in the types of devices that our customers had the most demand for, and there was some misalignment between where products were distributed and where there was demand, etc." The days of touchscreen supply woes are now a distant memory, however, and finger-friendly notebooks still aren't selling well. The desktop and its keyboard-and-touchpad interface are simply superior on traditional PCs and laptops, and while touchscreens are certainly a welcome addition on notebooks—I love being able to reach out and quickly tap a Live Tile or desktop icon!—they simply don't offer enough value for the money just yet. “Premium pricing and a lack of compelling uses for touch screens on notebooks continue to hinder adoption,” NPD DisplaySearch senior analyst Richard Shim said in the firm's press release. Indeed, the firm expects touchscreen laptops to continue their upward sales trajectory as time goes on. The price of laptops with fingerlicious displays has been falling since their introduction, and going forward, all notebooks that want to carry Intel's "Ultrabook" moniker will be required to include a touchscreen. Even still, NPD DisplaySearch only expects touchscreen laptops to comprise just north of 40 percent (and south of half) of all notebook sales by 2017. Maybe that's why Microsoft bolstered the traditional desktop options in the (superb) Windows 8.1 update? And if you're one of the 93 percent of recent laptop buyers who chose to skip the touchscreen price premium, be sure to check out PCWorld's guide to banishing Metro from Windows 8.1 to bask in the sweet, sweet desktop bliss.